application - The use to which a lighting system will be put; for example, a lamp may be intended for indoor residential applications. ballast - A device required by electric-discharge light sources such as fluorescent or HID lamps to regulate voltage and current supplied to the lamp during start and throughout operation. lumen depreciation - The decrease in lumen output that occurs as a lamp is operated, until failure. Also referred to as lamp lumen depreciation (LLD). color rendering index (CRI) - A rating index commonly used to represent how well a light source renders the colors of objects that it illuminates. For a CRI value of 100, the maximum value, the colors of objects can be expected to be seen as they would appear under an incandescent or daylight spectrum of the same correlated color temperature (CCT). Sources with CRI values less than 50 are generally regarded as rendering colors poorly, that is, colors may appear unnatural. color shift - The change in a lamp�s correlated color temperature (CCT) at 40% of the lamp�s rated life, in kelvin (K). ultraviolet - Any radiant energy within the wavelength range 100 to 400 nanometers is considered ultraviolet radiation (1 nanometer = 1 billionth of a meter, or 1 X 10-9 m). wavelength - The distance between two corresponding points of a given wave. Wavelengths of light are measured in nanometers (1 nanometer = 1 billionth of a meter, or 1 X 10-9 m) arc tube - An envelope, usually quartz or ceramic that contains the arc of a discharge light source. electrodes - The structure that serves as the electric terminals at each end of electric discharge lamps. high-intensity discharge (HID) - An electric lamp that produces light directly from an arc discharge under high pressure. Metal halide, high-pressure sodium, and mercury vapor are types of HID lamps. power quality - The degree to which current and voltage wave forms conform to a sinusoidal shape and are in synchronous phase with each other. Poor power quality results when the wave forms are distorted and/or out of phase and can interfere with data communications, cause inefficient operation or failure of other electrical equipment on the same supply line, and result in excessive current in electrical distribution lines. grid - The combination of electric power plants and transmission lines operated by an electric utility. restrike time - The time required for a lamp to restrike, or start, and to return to 90% of its stabilized light output after the lamp is extinguished. Normally, HID lamps need to cool before they can be restarted. shielding - Blocking an electric or magnetic field with a metallic substance. The incident field induces currents in the metallic substance, and these currents induce a field that opposes the incident field. Shielding reduces radiated electromagnetic waves. Electronic components, wires, lamps, and devices can all be shielded. visual performance - The quantitative assessment of the performance of a visual task, taking into consideration speed and accuracy. warm-up time - The time it takes for a lamp to produce 90% of its stabilized light output when it is started, unless otherwise indicated. high-pressure sodium (HPS) - A high-intensity discharge lamp type that uses sodium under high pressure as the primary light-producing element. HPS lamps produce light with a correlated color temperature (CCT) of approximately 2000 kelvins, although CCTs for lamps having higher CRI values range from 2200 to 2700 kelvins. Standard lamps have a CRI value of 22; others have CRI values from 60 to 80. HPS lamps are among the most efficacious light sources, with efficacies as high as 150 lumens per watt, although those with higher CRI values have efficacies as low as 25 lumens per watt. initial light output - A lamp's light output, in lumens, after 100 hours of seasoning. lamp - A radiant light source. luminaire - A complete lighting unit consisting of a lamp or lamps and the parts designed to distribute the light, to position and protect the lamp(s), and to connect the lamp(s) to the power supply. (Also referred to as fixture.) frequency - The number of cycles completed by a periodic wave in a given unit of time. Frequency is commonly reported in cycles per second, or hertz (Hz). correlated color temperature (CCT) - A specification for white light sources used to describe the dominant color tone along the dimension from warm (yellows and reds) to cool (blue). Lamps with a CCT rating below 3200 K are usually considered warm sources, whereas those with a CCT above 4000 K usually considered cool in appearance. Temperatures in between are considered neutral in appearance. Technically, CCT extends the practice of using temperature, in kelvins (K), for specifying the spectrum of light sources other than blackbody radiators. Incandescent lamps and daylight closely approximate the spectra of black body radiators at different temperatures and can be designated by the corresponding temperature of a blackbody radiator. The spectra of fluorescent and LED sources, however, differ substantially from black body radiators yet they can have a color appearance similar to a blackbody radiator of a particular temperature as given by CCT. efficacy - The ratio of the light output of a lamp (lumens) to its active power (watts), expressed as lumens per watt. electromagnetic interference (EMI) - The interference of unwanted electromagnetic signals with desirable signals. Electromagnetic interference may be transmitted in two ways: radiated through space or conducted by wiring. The Federal Communications Commission (FCC) sets electromagnetic interference limits on radio frequency (RF) lighting devices in FCC Part 18. horizontal illuminance - The average density of luminous flux incident on a horizontal surface, measured in footcandles (fc) or lux (lx). One fc equals 10.76 lx. mercury vapor (MV) lamp - A high-intensity discharge lamp type that uses mercury as the primary light-producing element. Mercury vapor lamps produce light with a CCT from 3000 to 7000 K. Mercury vapor lamps with clear outer bulbs have CRI values from 15 to 25, whereas phosphor-coated lamps have CRI values from 40 to 55. Mercury vapor lamps are less efficacious than other HID lamp types, typically producing only 30 to 65 LPW, but they have longer lamp lives and lower initial costs than other HID lamp types. metal halide (MH) lamp - A high-intensity discharge lamp type that uses mercury and several halide additives as light-producing elements. Metal halide lamps have better color properties than other HID lamp types because the different additives produce more visible wavelengths, resulting in a more complete spectrum. Metal halide lamps are available with CCTs from 2300 to 5400 K and with CRI values from 60 to 93. Efficacies of metal halide lamps typically range from 75 to 125 LPW. operating position - The manufacturer-recommended operating position for a lamp. power - The power used by a device to produce useful work (also called input power or active power). In lighting, it is the system input power for a lamp and ballast or driver combination. Power is typically reported in the SI units of watts. power line carrier (PLC) - A system that transmits high-frequency (50 to 500 kHz) analog or digital signals via the power lines of a building. These signals control devices such as luminaires or contain voice transmissions such as intercom messages. Some commercial and residential energy management systems also use power line carrier systems. glare - The sensation produced by luminances within the visual field that are sufficiently greater than the luminance to which the eyes are adapted, which causes annoyance, discomfort, or loss in visual performance and visibility. color rendering - A general expression for the effect of a light source on the color appearance of objects in conscious or subconscious comparison with their color appearance under a reference light source. sky glow - Brightening of the sky caused by outdoor lighting and natural atmospheric and celestial factors. ambient temperature - The temperature of the surrounding air that comes into contact with the lamp and ballast. Ambient temperature affects the light output and active power of fluorescent lamp/ballast systems. Each fluorescent lamp-ballast system has an optimum ambient temperature at which it produces maximum light output. Higher or lower temperatures reduce light output. For purposes of lamp/ballast tests, ambient temperature is measured at a point no more than 1 meter (3.3 feet) from the lamp and at the same height as the lamp. system efficacy - Also referred to as relative system efficacy, system efficacy is a measurement of a system'�s ability to convert electricity into light. Measured in lumens per watt (LPW), system efficacy is the ratio of the light output (in lumens) to the active power (in watts). rated lumen - Also referred to as rated light output from lamp in lumens. Lumen refers to a unit measurement of the rate at which a lamp produces light. A lamp�s light output rating expresses the total amount of light emitted in all directions per unit time. Manufacturers rate their lamps� initial light output after 100 hours of operation. lumen maintenance - The ability of a lamp to retain its light output over time. Greater lumen maintenance means a lamp will remain brighter longer. The opposite of lumen maintenance is lumen depreciation, which represents the reduction of lumen output over time. Lamp lumen depreciation factor (LLD) is commonly used as a multiplier to the initial lumen rating in illuminance calculations to compensate for the lumen depreciation. The LLD factor is a dimensionless value between 0 and 1. uniformity - The degree of variation of illuminance over a given plane. Greater uniformity means less variation of illuminance. The uniformity ratio of illuminance is a measure of that variation expressed as either the ratio of the minimum to the maximum illuminance or the ratio of the minimum to the average illuminance. footcandle (fc) - A measure of illuminance in lumens per square foot. One footcandle equals 10.76 lux, although for convenience 10 lux commonly is used as the equivalent. nadir - In the lighting discipline, nadir is the angle pointing directly downward from the luminaire, or 0�. Nadir is opposite the zenith. rated lamp life - The number of hours at which half of a group of product samples fail. The rated life is a median value of life expectancy; any lamp or group of lamps may vary from the published rated life. Rated life is based on standard test conditions. driver - For light emitting diodes, a device that regulates the voltage and current powering the source. heat sinking - Adding a material, usually metal, adjacent to an object in order to cool it through conduction. spectral power distribution (SPD) - A representation of the radiant power emitted by a light source as a function of wavelength. rated light output - The sum of the initial rated lamp lumens of the lamp(s) that were supplied with the luminaire. chromaticity - The dominant or complementary wavelength and purity aspects of the color taken together, or of the aspects specified by the chromaticity coordinates of the color taken together. It describes the properties of light related to hue and saturation, but not luminance (brightness). gamut area - A measure of color rendering based upon volume in color space. It is the range of colors achievable on a given color reproduction medium (or present in an image on that medium) under a given set of viewing conditions. photopic - Vision mediated essentially or exclusively by the cones. It is generally associated with adaptation to a luminance of at least 3.4 cd/m2. CIE - Abbreviated as CIE from its French title Commission Internationale de l'Eclairage, the International Commission on Illumination is a technical, scientific, and cultural organization devoted to international cooperation and exchange of information among its member countries on matters relating to the science and art of lighting. standard deviation - A measure of the average distance of a set of data points from their mean. A set of data points that are all close to their mean will have a smaller standard deviation than a set of points that are further from their mean. MacAdam ellipse - Researcher David L. MacAdam showed that a just noticeable difference (JND) in the colors of two lights placed side-by-side was about three times the standard deviation associated with making color matches between a reference light and a test light (MacAdam 1942, Wyszecki and Stiles 1982). These JNDs form an elliptical pattern of "constant discriminability" in a chromaticity space, centered on the chromaticity of a reference light, known as MacAdam ellipse. fluorescent lamp - A low-pressure mercury electric-discharge lamp in which a phosphor coating on the inside of the glass tubing transforms most of the ultraviolet energy created inside the lamp into visible light. light-emitting diode (LED) - A solid-state electronic device formed by a junction of P- and N-type semiconductor material that emits light when electric current passes through it. LED commonly refers to either the semiconductor by itself, i.e. the chip, or the entire lamp package including the chip, electrical leads, optics and encasement. illuminance - The density of luminous flux incident upon a surface. Illuminance is measured in footcandles (lumens/square foot) or lux (lumens/square meter). One footcandle equals 10.76 lux. lamp life - The number of hours at which half of a large group of lamps have failed when operated under standard testing conditions. lumen (lm) - A unit measurement of the rate at which a lamp produces light. A lamp's lumen output rating expresses the total amount of light the lamp emits in all directions per unit time. This estimate of expanded uncertainty uses a coverage factor of k = 2, covering two standard deviations. Is electromagnetic compatibility a concern for plasma lighting systems? Yes. Plasma lighting systems operate at high frequencies and can be a source of both radiated and conducted electromagnetic interference (EMI) (Lapatovich 2012). If the luminaire containing the plasma lighting system is not shielded, the luminaire can cause interference with other electronic equipment. Controlling a device's EMI so that it can operate satisfactorily alongside other electronic devices is known as electromagnetic compatibility (EMC). The Federal Communication Commission (FCC) specifies limits for conducted and radiated emissions for radio frequency (RF) digital devices (Part 15) and for industrial, scientific and medical equipment (Part 18) which includes RF lighting devices. FCC Part 15 includes two classes: Class A covers digital devices that are marketed exclusively for use in business, industrial and commercial environments; Class B covers digital devices that are marketed for use anywhere, including residential environments. FCC Part 18 covers two types of usage: non-consumer equipment and consumer equipment. The FCC limits only pertain to electromagnetic radiation at distances of 3 m (10 ft) and greater from the luminaire. To NLPIP's knowledge, there are no requirements from the FCC or other governing bodies that would cover EMC for devices less than 3 m (10 ft) from the RF device, such as a wireless sensor placed on the luminaire. Therefore, luminaires and other electronic devices that meet the FCC requirements for radiated emissions could still be sources of EMI for devices nearer than 3 m (10 ft). NLPIP sent the Stray Light Optical Technologies Tesla II streetlight to Underwriters Laboratories (UL) in Melville, New York for EMC testing. The measured Topanga system was not tested for EMI, because it was a demonstration kit and the manufacturer indicated that it was not adequately shielded to prevent EMI. The Tesla II streetlight was tested to determine if it complied with FCC Part 15 Class A and B and FCC Part 18 non-consumer and consumer limits. According to FCC, residential environments are not limited to property lines and would include city streets in residential neighborhoods (FCC 2013). As a guideline, streetlights installed within 250 ft (76 m) of a residential property line are considered to be operating in a residential environment (FCC 2013). Streetlights installed in a residential area would need to meet the consumer limits for Part 18 RF lighting devices or the Part 15 Class B limits as applicable. The radiated emissions were measured at 3 m (10 ft) and 10 m (33 ft). The luminaires were measured at 3 m (10 ft) over a frequency range of 30 to 10,000 megahertz (MHz), and at 10 m (33 ft) over a frequency range of 30 to 1000 MHz. 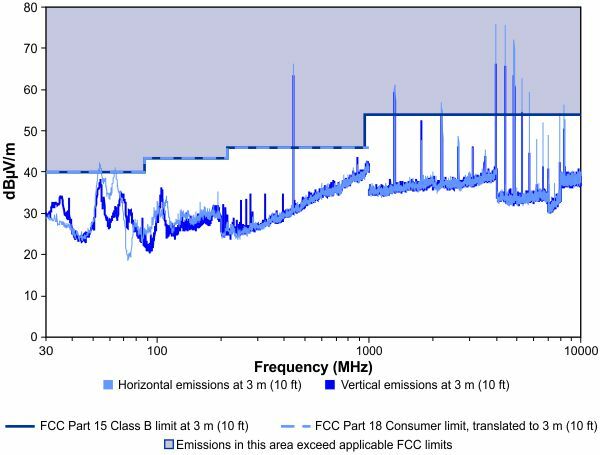 FCC Part 15 Class B and FCC Part 18 limits were compared to the radiated emissions measured at 3 m (10 ft), the FCC Part 15 Class A limits were compared to the radiated emissions measured at 10 m (33 ft). In addition, the radiated emissions measured at 3 m (10 ft) were compared to the FCC Part 15 Class A limits translated to 3 m (10 ft) using an inverse relationship between field strength and distance. The Tesla II datasheet indicated that the luminaire is in compliance with FCC Part 18 Class A and CISPR 22, an international EMC standard from the International Electrotechnical Commission (IEC). FCC allows digital devices to comply with the radiated emissions limits in CISPR 22, third edition, as an alternative to the radiated limits given in FCC Part 15. NLPIP asked UL to verify that the Tesla II streetlight met FCC limits when the luminaire was operated at full power, and also when the luminaire was dimmed to 50% light output and 20% light output. NLPIP attached a rotary dimmer that was provided by Stray Light Optical Technologies to dim the streetlight during EMC testing. NLPIP marked the dimmer at 100%, 50%, and 20% of full light output to indicate how much UL was to dim down the luminaire during testing. Results of the EMC testing showed that the Tesla II streetlight exceeds the maximum allowable radiated emissions set by the FCC Part 15 Class A and B limits, and Part 18 consumer and non-consumer limits at full power and at both measured dimming levels. 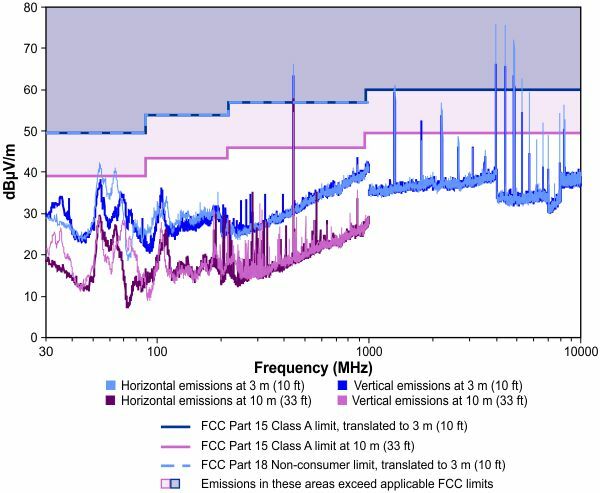 Figure 13 shows the measured radiated emissions at 100% light output at 3 m (10 ft) and 10 m (33 ft), compared to the FCC Part 15 Class A limits at 3 m (10 ft) and 10 m (33 ft) and the FCC Part 18 non-consumer limits scaled to the 3 m (10 ft) testing distance. Figure 14 shows the measured radiated emissions at 100% light output at 3 m (10 ft) compared to the FCC Part 15 Class B limit of at 3 m (10 ft) and Part 18 consumer limits scaled to the 3 m (10 ft) testing distance. The Tesla II streetlight exceeded the FCC limits by up to 13 times the maximum allowable radiated emissions, when operated at full power. Even when the luminaire was dimmed down to 20%, it exceeded FCC limits by up to 7 times the maximum allowable radiated emissions. Figure 13 . Radiated emissions from a Tesla II streetlight compared to the FCC commercial limits (FCC Part 15 Class A and FCC Part 18 non-consumer limits) at 100% light output, measured 3 m (10 ft) from the luminaire and 10 m (33 ft) from the luminaire. The Y-axis in decibels (dB) indicates the electric field strength relative to 1 microvolt (µV) per meter. Emissions in the shaded area of the figure exceed the maximum allowable FCC limits. Figure 14: Radiated emissions from a Tesla II streetlight compared to the FCC residential limits (FCC Part 15 Class B and FCC Part 18 consumer limits) at 100% light output, measured 3 m (10 ft) from the luminaire. The Y-axis in decibels (dB) indicates the electric field strength relative to 1 microvolt (µV) per meter. Emissions in the shaded area of the figure exceed the maximum allowable FCC limits.